TYAN introduced its first server and its first motherboard for AMD’s new EPYC processors. The company decided to take a cautious approach to AMD’s EPYC, and the initial machine will be a single-socket server for high-performance all-flash storage applications. Meanwhile, the new platforms from TYAN will be among the first applications to support OCuLink connections. 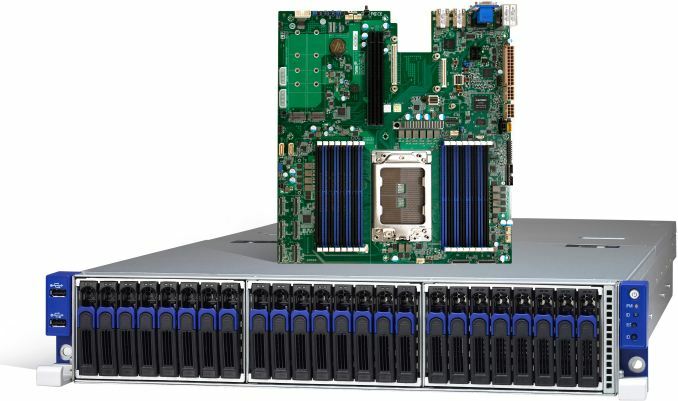 The first TYAN platform based on the AMD EPYC 7000-series processor capitalizes on the CPU’s primary advantage besides its core count (up to 32): the number of integrated PCIe 3.0 lanes (up to 128) that can be used to connect NVMe SSDs without any external switches or controllers. The TYAN TN70A-B8026 server is based on the S8026 motherboard that has 16 DDR4 DIMMs slots (two modules are supported per channel, 1 TB of DDR4 in total), two M.2-22110 slots for SSDs (PCIe 3.0 x4) as well as eight SFF-8611 PCIe/OCuLink x8 connectors for 24 hot-swap SSDs in U.2 form-factor. In total, the server supports 26 PCIe 3.0 x4 SSDs as well as two SATA devices. 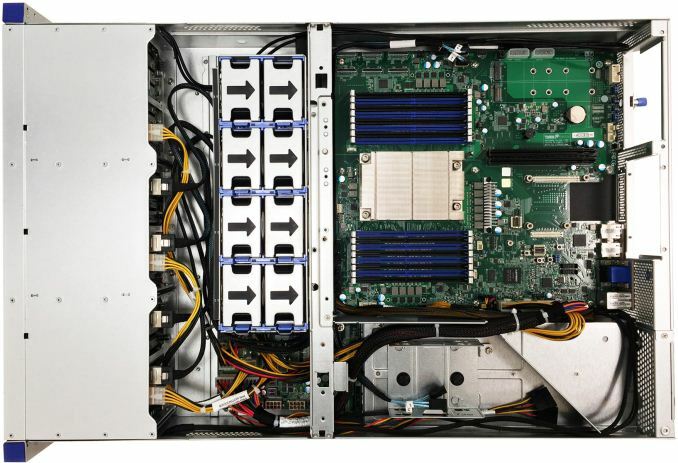 The platform also supports five PCIe 3.0 x8 slots via 2U risers (these slots function when storage drives are not using their PCIe connections) as well as one PCIe 3.0 x16 OCP 2.0-capable slot for an EDR InfiniBand or a 100 GbE card. To support even the most power hungry components, TYAN equips its TN70A-B8026 with a redundant 770 W power supplies. As for management and networking, the machine is equipped with the AST2500 BMC with iKVM & Redfish support, two GbE ports (Broadcom BCM5720) for connectivity and one GbE for IPMI. TYAN does not say which SSDs it's going to use for the TN70A-B8026 and how many terabytes of storage in total the machine can support. What the company does say is that a pair of SFF-8611 OCuLink x8 connectors can be re-configured (from BIOS) to support up to 16 SATA 6 Gbps drives, which provides flexibility to server makers or value-add resellers, who plan to use the TYAN S8026 motherboard or the TN70A-B8026 server barebones. In fact, the latter fits into regular E-ATX supporting cases, so it can be used to build workstations with enhanced storage capabilities. TYAN did not announce MSRP or ETA for its TN70A-B8026 server as well as the S8026 motherboard. Since the server can be equipped with different CPUs and SSDs, its price can vary by orders of magnitude and it does not make a lot of sense to make guesses at this point. Considering that high-endurance/high-capacity SSDs are quite expensive, a fully populated TYAN TN70A-B8026 machine can easily cross the $100K mark.